Disappointment is a powerful weapon in a parent’s arsenal. It’s not the same as anger, frustration or fear. 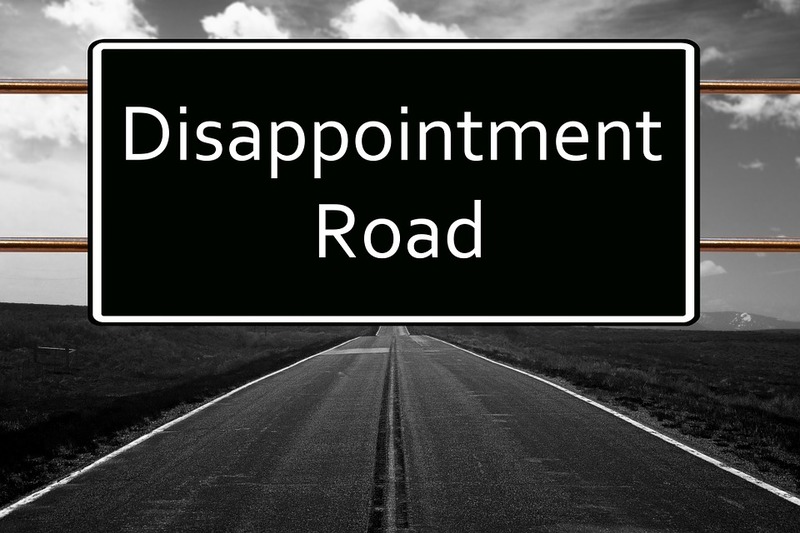 Disappointment says “I know better than you.” It says, “You didn’t do it my way and therefore you did it the wrong way.” Disappointment from a parent is the nuclear option. I cannot remember a single time when my parents expressed genuine disappointment with me. There was plenty of frustration and anger, like the summer I spent in my bedroom reading Gone With The Wind and sobbing. My mother finally tore the book from my hands and threatened to burn it if I didn’t come out of my room and get a life. This is not to say that I didn’t disappoint my parents from time to time. It is to say that they never let it show. Would that I had learned from their example. As a mother of adult children, my ego has been too often wrapped up in their successes and failures. I have burdened them with my expectations and barely masked my crushing disappointment when they didn’t follow my plan. It slapped me upside the head. I had been expecting my children to make me glad, when I came to them with nothing but heaviness. I’m not advocating a Pollyanna approach. For those of you born after the baby boom, “Pollyanna”was a book and then a movie about an annoyingly chipper little girl. And then it became an epithet. The Merriam-Webster dictionary defines “pollyanna” as an adjective: “a person characterized by irrepressible optimism and a tendency to find good in everything.” And as you might imagine in our jaded 21st Century, it isn’t a compliment. A Pollyanna mother would beam at her incarcerated son through bullet proof glass and tell him how proud she was that he had earned a roof over his head and three squares a day for the next 25 to life. Someone short of Pollyanna, however, would put on her best face and tell her son that she still believed in him and his ability to make something positive out of any circumstance. Fortunate is the child who has a parent with a gift for enjoying the ride. But our disappointment is real and something that must be managed lest we poison our relationships with our adult children and undermine their confidence. Four scholars specializing in human development and family studies at three universities studied the phenomenon of parental disappointment. The four, Kelly Cichy, Eva Lefkowitz, Eden Davis and Karen Fingerman, published their findings in a report they called “‘You are Such a Disappointment!’: Negative Emotions and Parents’ Perceptions of Adult Children’s Lack of Success.” They found that when parents like you perceive their children are not living up to expectations, their emotions can include disappointment, anger, guilt and worry. That is an unholy quartet guaranteed to make parents miserable and children frustrated. • Parents may interpret their child’s failure as their own failure. • Parents may worry that an unsuccessful child may be a burden in the future when the child needs to be helping the aging parent. • Parents may have different goals and expectations for their sons than for their daughters and may put different energies and resources into them when they are at risk. • Fathers are more likely to react with anger when a child is perceived to be failing in a career, especially if family money was wasted. • Mothers are more likely than fathers to take responsibility for a child’s failure in relationships, particularly a daughter. • Adult children who pick up on their parents’ disappointment can respond in one of two ways. The one you hope for is that they kick into gear and make something of themselves. (Good luck with that.) They could instead adopt your negative emotions about themselves. There is a ray of hope in the research. If your child is a young adult, your disappointment may be temporary. They are still works in progress and you may yet look back on this time of worry and wonder what all the fuss was about. If you are such a personality — a collector of bad situations — your adult children will fare better if you keep that collection to yourself. Try approaching them with more optimism and confidence in their adulthood. You need not endorse their failures. You only need to help the adult child take ownership of those failures and learn from them. It is likely they are already disappointed enough in themselves and may have been harshly judged by friends, employers, teachers and even strangers. Don’t pile on. I love this post Daryl. It is great to remember the toxicity of expressing disappointment in our relationships. It reminded me of the meat in Madeline Levine’s book ‘Teach your Children Well’ — how important it is to try and remove our own anxieties from our expectations of our children. I often have to ask myself—is your behavior upsetting me because of my own anxieties or expectations or because it is not appropriate? If it is the first I have to recalibrate how I approach the situation. Thanks for posting! Thanks, Katie. Sounds like this is another book I should read, as soon as I finish the last massive tome you recommended! Great advice, Daryl! Not just for those with adult children, but those with little ones as well. As you know, I suffer (or thrive depending how you look at it!) under a parent’s disappointment. I have been striving for my father’s approval since my earliest memory. It has driven many of my decisions from finishing college in 3 years to nearly all of my parenting decisions. I won’t lie to you or to myself, there are decisions my kids make that I hold on with white knuckles and brace for the worst, but I try not to let my kids know there is a possible disappointment. Most of their decisions, I am so proud that they are making their own path and even if it is not the journey I would have chosen for them it is unbelievable to me how they “figure it out”! Of course, I have family members to serve as a cautionary tale for my kids and maybe that is my “ace in the hole” so to speak. I am very thankful that my kids will at least listen to what I say (although they don’t always take my advise) and critically think using as much information as they can. Amy, you’re an awesome mother, largely because of the way you were parented. I bet you never thought that would be an advantage. Not until recently! We are all a product of our childhood and knowing what I know now wouldn’t change a thing!